Over this past weekend, I got a few moments out in the garage here and there, some of those accompanied by my son. 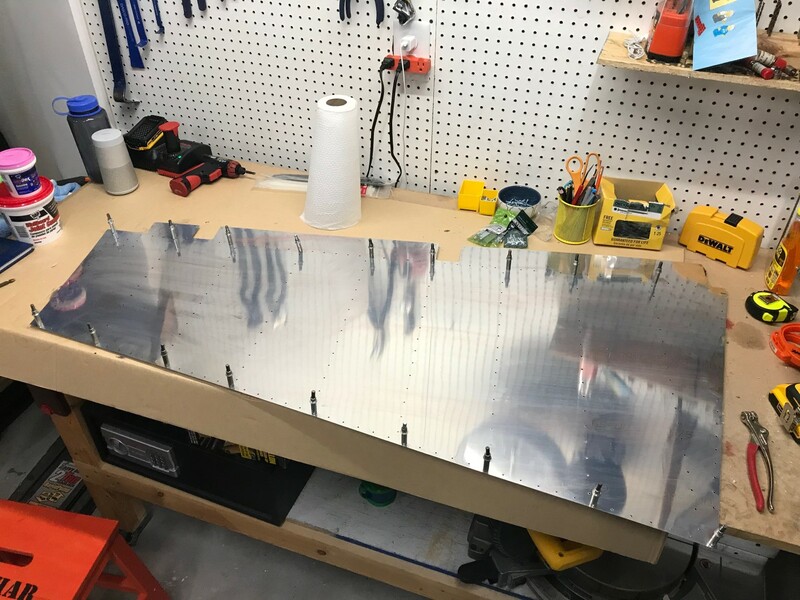 I did a little more work on the rudder, final-drilling and deburring the remaining stiffener holes. Also, 16 more rivets drilled out of the rudder tip rib. 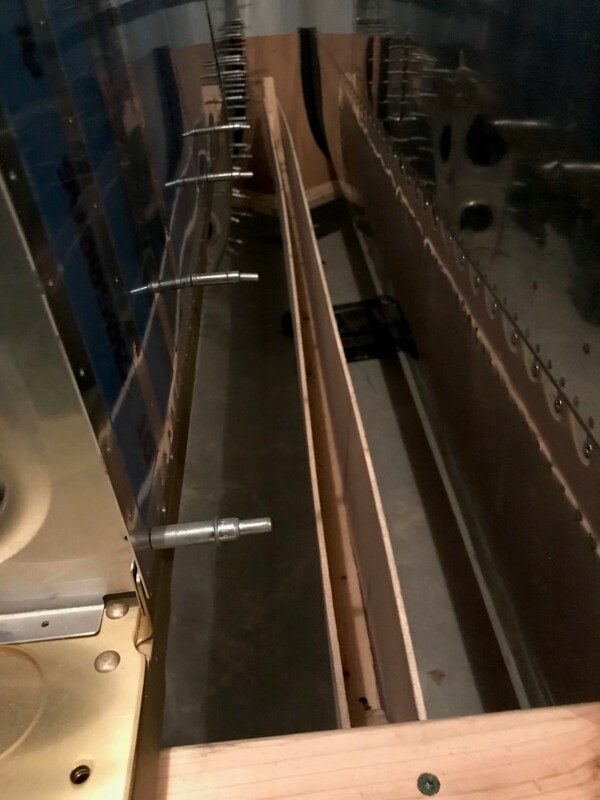 I need access below the tip rib to buck the new rudder skins to the counterbalance skins. after all drilling and deburring. 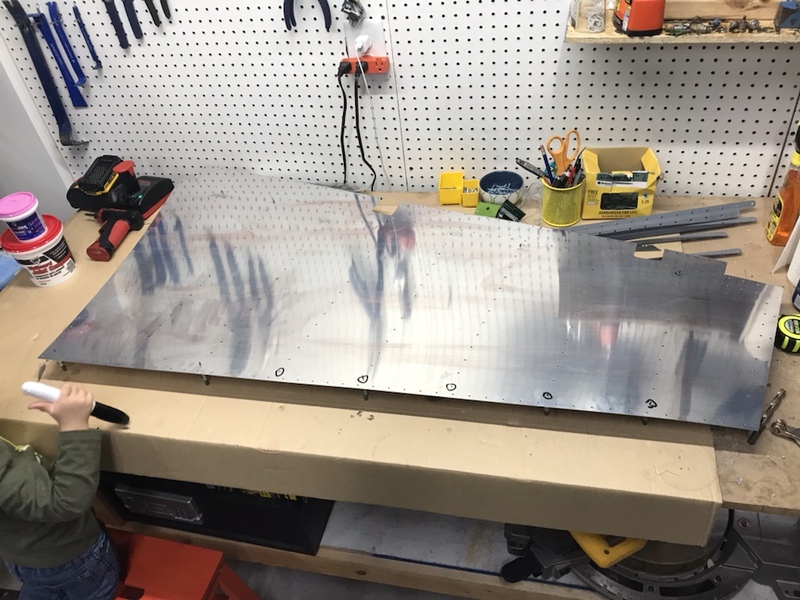 Finally, with skin dimpling coming soon, I built a couple c-frame tables. 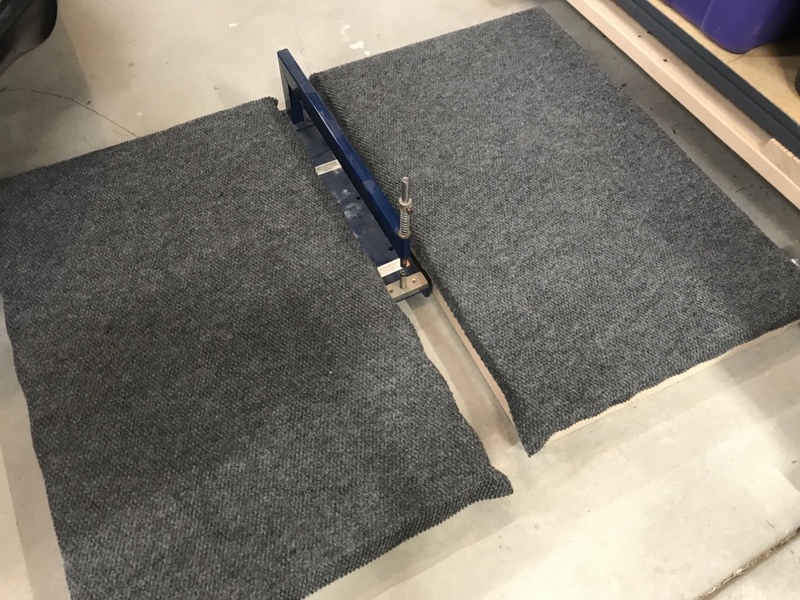 Instead of making the fancy one with the slot for the c-frame to slide into, I just made two bigger ones. I made sure the female dimple die on the bottom was only slightly higher than the surface of the tables. We’ll see how it works over the next few days. 2.0 hours over 3 days. 16 rivets drilled out. 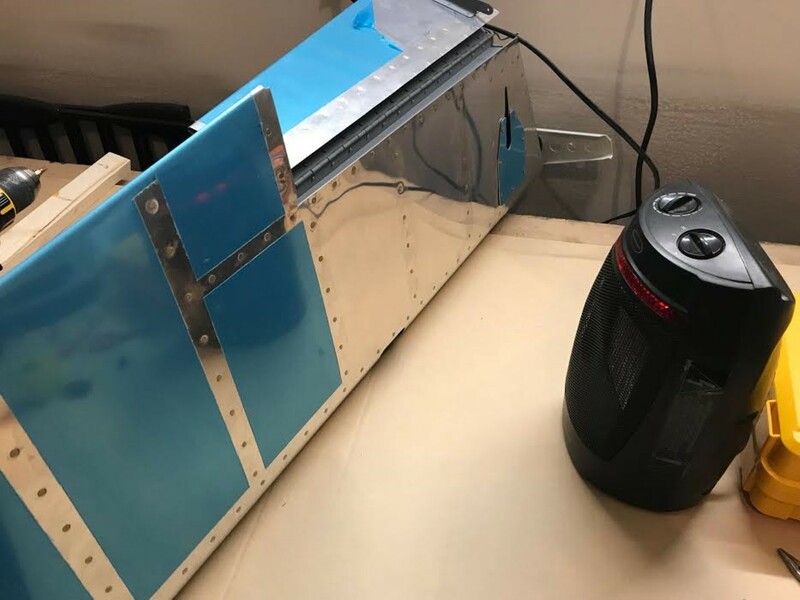 After a late day at work, I had some quiet things I knew I could do on the airplane that still let me get to bed at a reasonable hour. 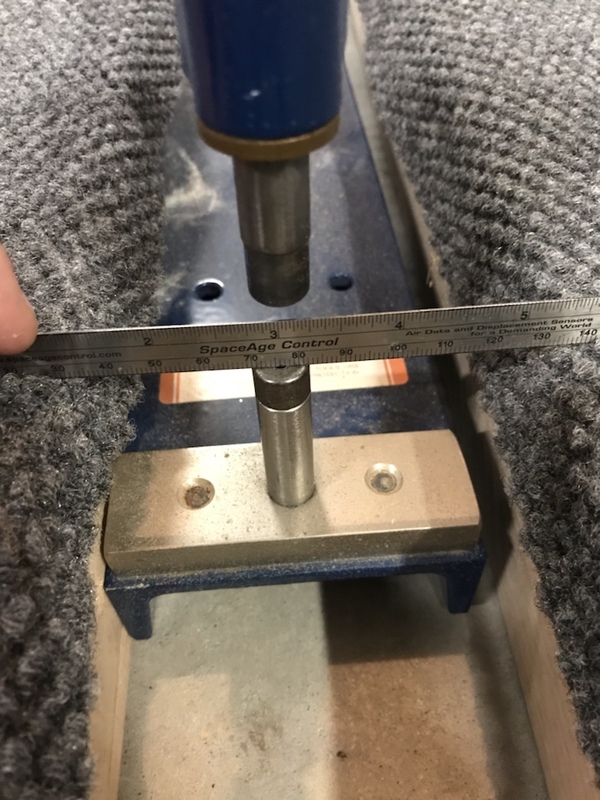 So I grabbed my freshly-drilled right rudder skin and deburred all of the holes I knew I could dimple with the (quiet) hand squeezer. It’s been about 5 years since I last deburred a hole. 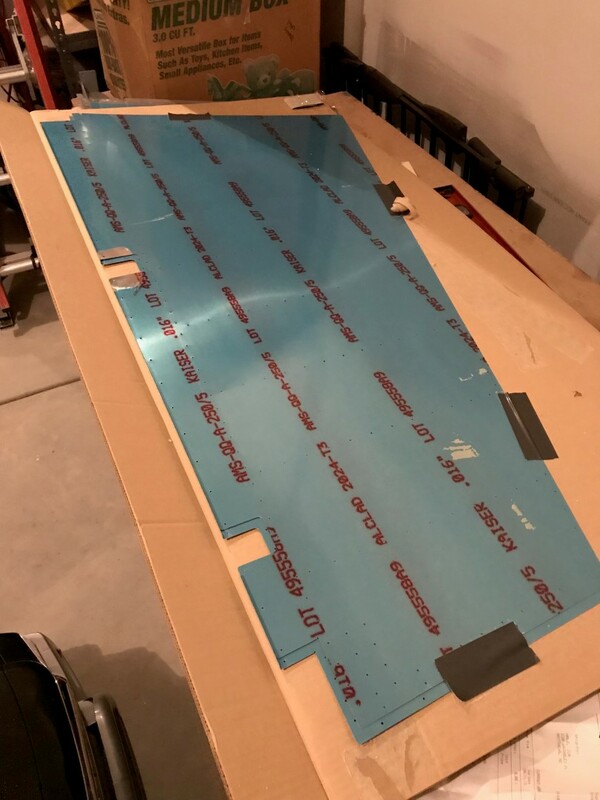 I clecoed the stiffeners to the skin to help have a more…well…stiff skin to work with. Floppy parts tend to get dropped and damaged. At the end of 30 minutes, I had a partly-dimpled right rudder skin. You can see some of the dimples along the edge of the skin. I’ll do the same to the left skin before getting the c-frame out and being loud. 0.5 hours. I forgot how much deburring with a drill bit in between my finger and thumb cramps my fingers. 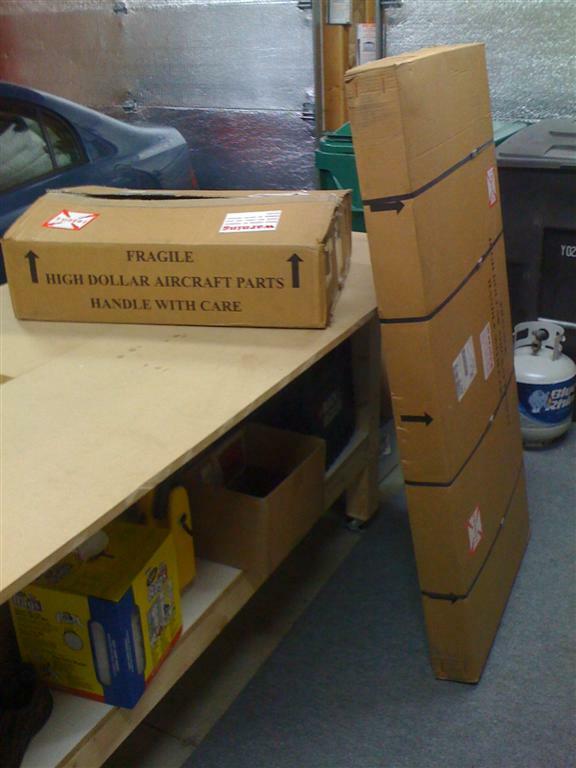 Another exciting night in the shop. T-Rex (that’s what I’m calling him for now) helped me, too. 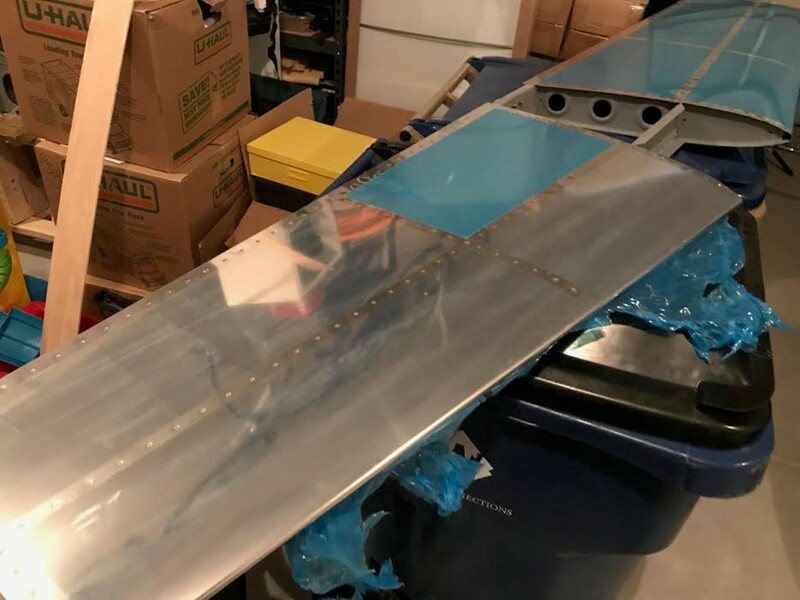 Since the rudder skeleton is now fully ready, We dug out the new skins and got them devinyled. 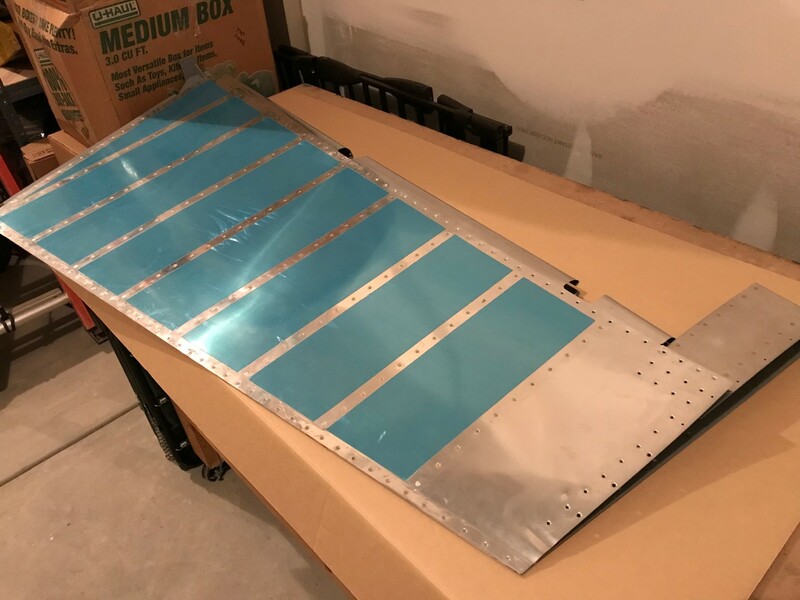 Last time around, I would have used a soldering iron to draw lines down the rivet holes and peel off just the blue vinyl we needed to. This time, we just pulled it all off. I guess I’m at a different point in my life now. Fast forward about an hour, and we had both sides of both skins devinyled. 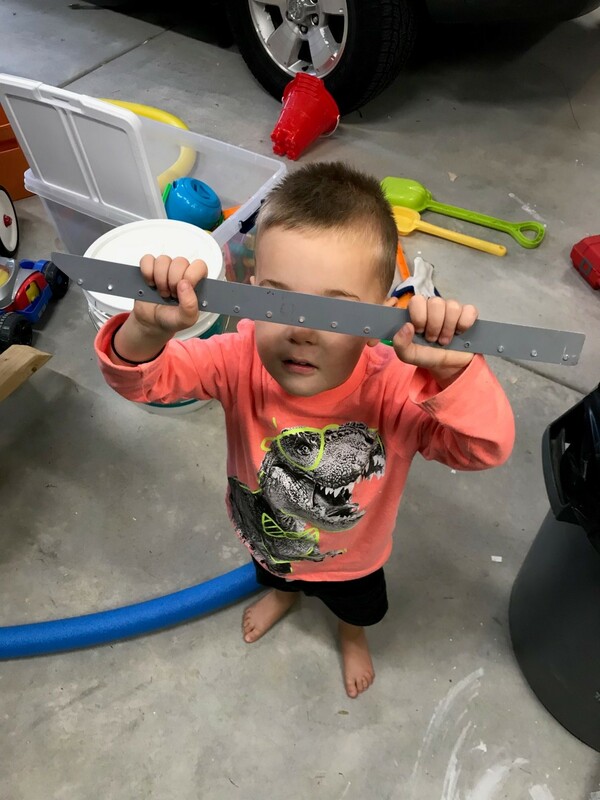 Now, what do you do with a toddler while you are trying to enlarge the prepunched holes to #40? 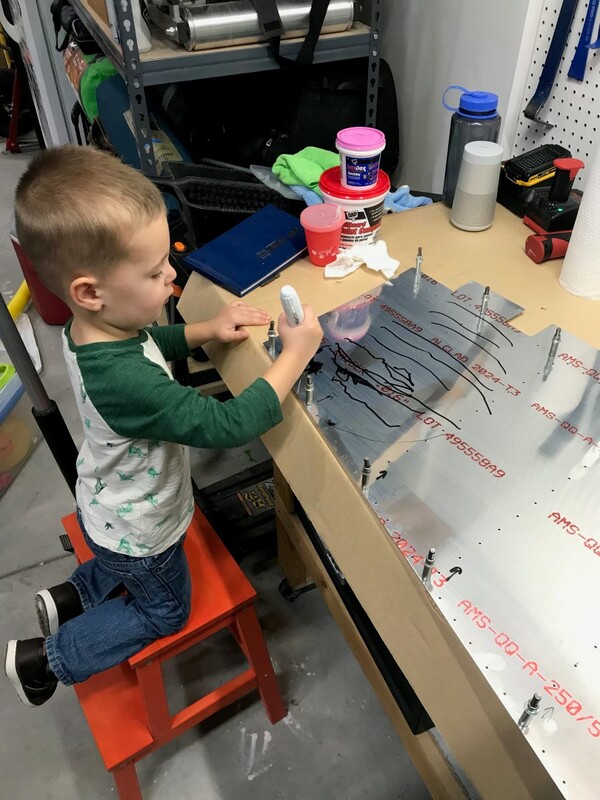 YOU GIVE HIM A PERMANENT MARKER and tell him he can draw on any blue or silver airplane part. 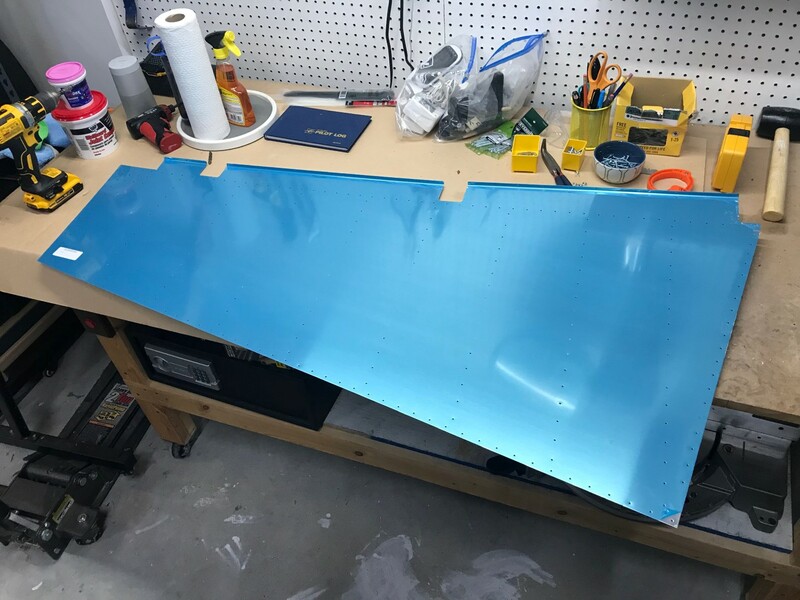 So, after a few passes with the drill, the Left Rudder skin is now ready for deburring and dimpling. I forgot how slow this goes. 1.5 hours on the rudder. (Oh, I upped the “reordered parts count” up to 9 (from 6). Even though I didn’t order them, they were purchased for the kit (by the gentleman who bought, then sold my kit back to me). Oh, and today marks the passing of 400 build hours. Only took me 9 years to get here. 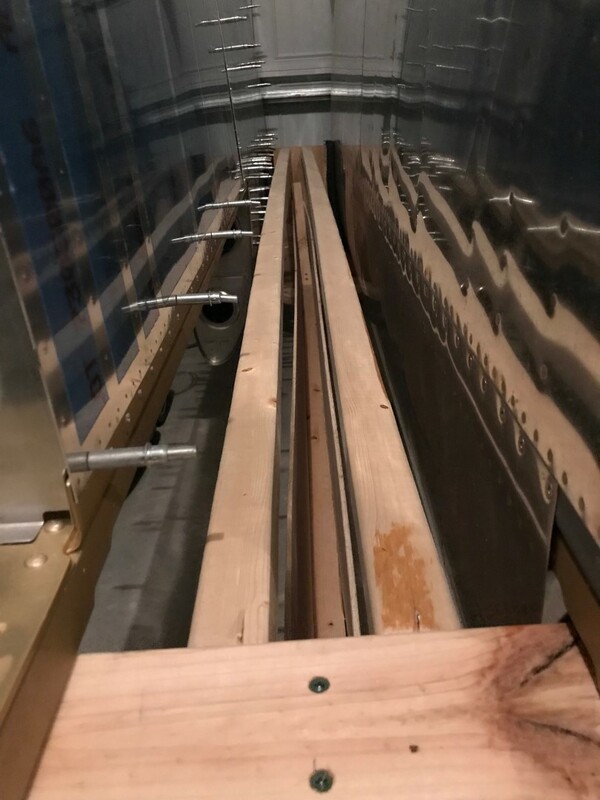 So after almost 9 months of not working on the airplane project, we finally got through enough of the rennovation (finishing basement) to get started in the garage again. 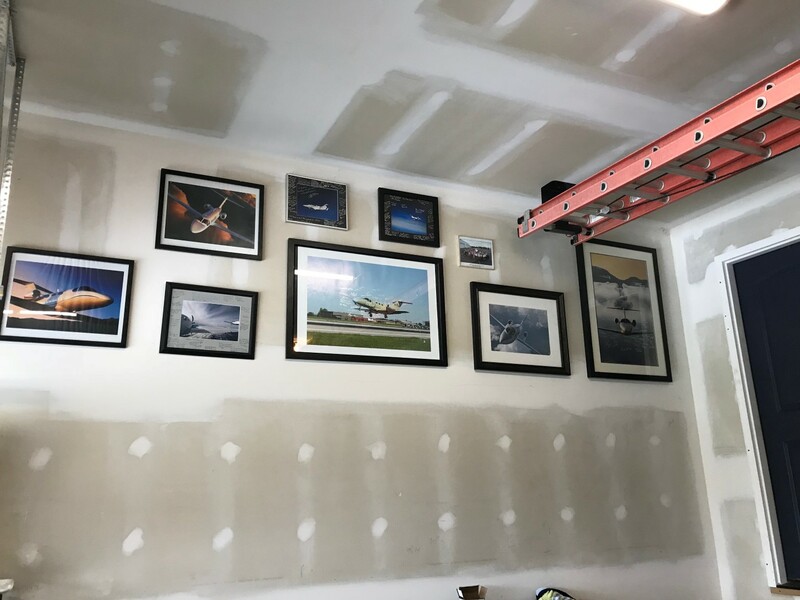 No, I haven’t painted the walls or ceiling yet, but I did want to get the airplane pictures I’ve been lugging around for years actually mounted to the wall. Wifey helped me decide on the wall. This wall is the least likely to get hit with other shop-related thrashing. Notice the blank space behind the ladder where I’ll inevitably bump it against the wall. We’ve been spending quite a bit of time outside, but we finally focused on the airplane for 30 minutes. 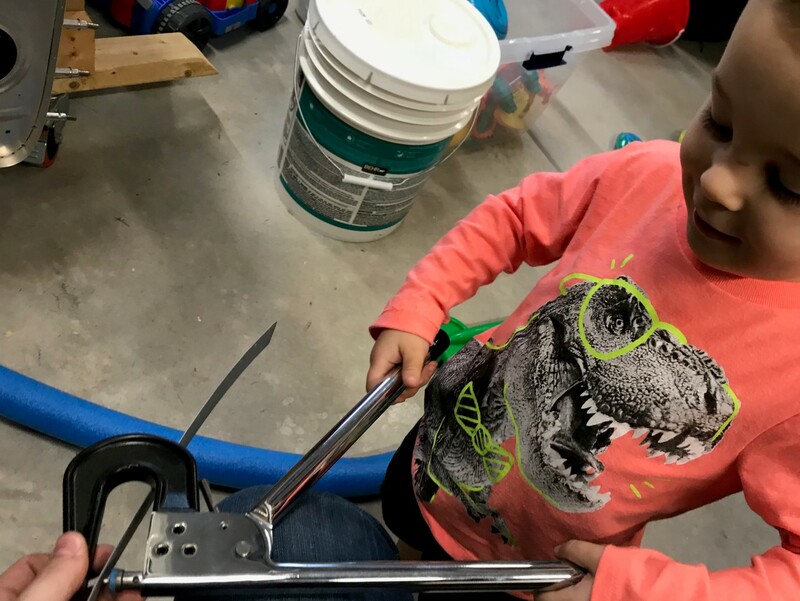 My almost-3 year old son was really eager to help, so I taught him out to use a squeezer. The task for today was to push out all the rivets from the individual parts. 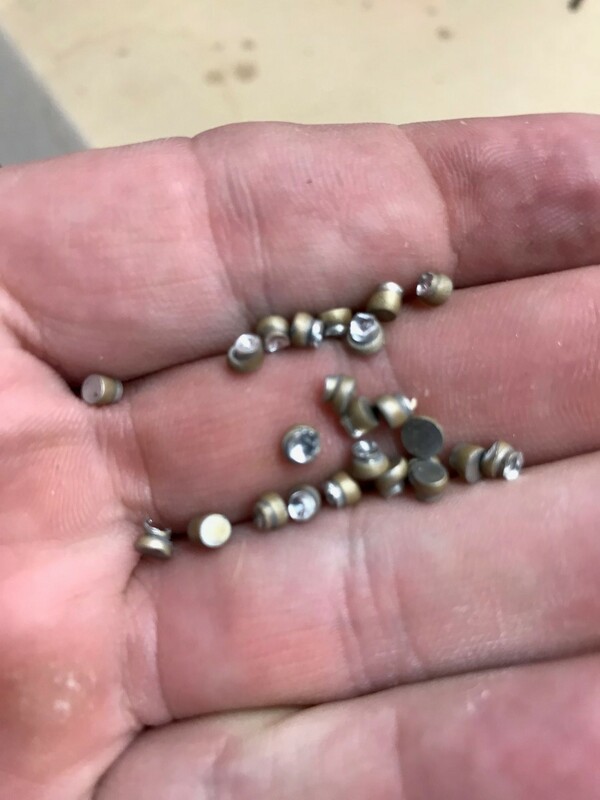 When drilling the shop heads off, the parts came apart, but sometimes the shaft of the rivet remained in the underlying structure. We’re using half of a dimple die to push them out. T-Rex heliping push some half-drilled rivets out of holes. Look Ma! No more rivet remnants. Here’s what we are pushing out. Here’s what we were pushing out. And the final product of the day. 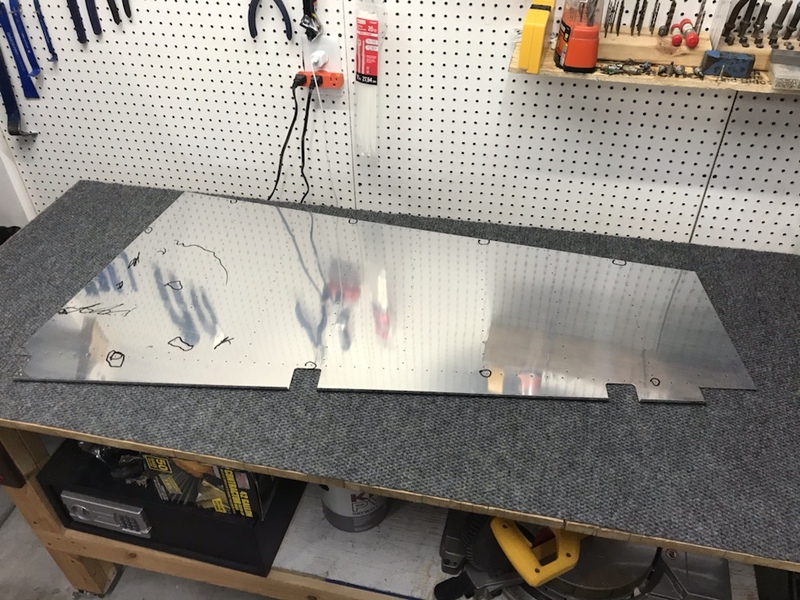 After pushing through some more of the ruddder stiffeners, a complete set. And I need to catch you all up on some other developments. I haven’t just been sitting around doing NOTHING on the airplane for years and years. 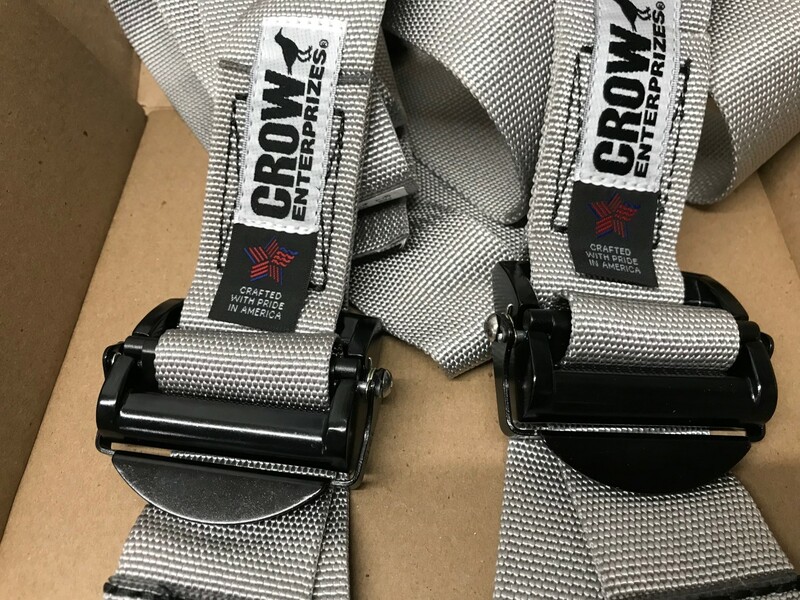 I settled on gray Crow harnesses. 5pt with Rotary Cam and black hardware. Also, the black adjusters. 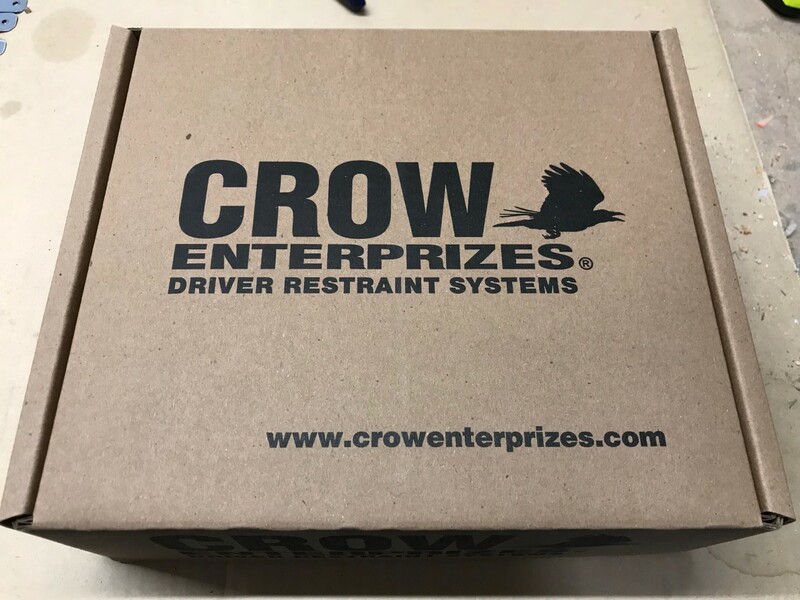 Also over the last year, my crow 5 pt. 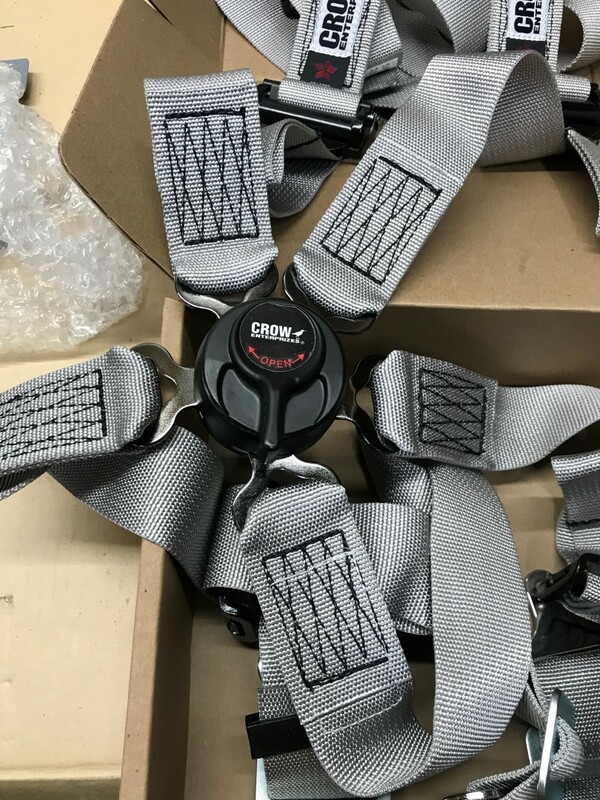 harnesses showed up. Here’s the cam release. Very high quality. 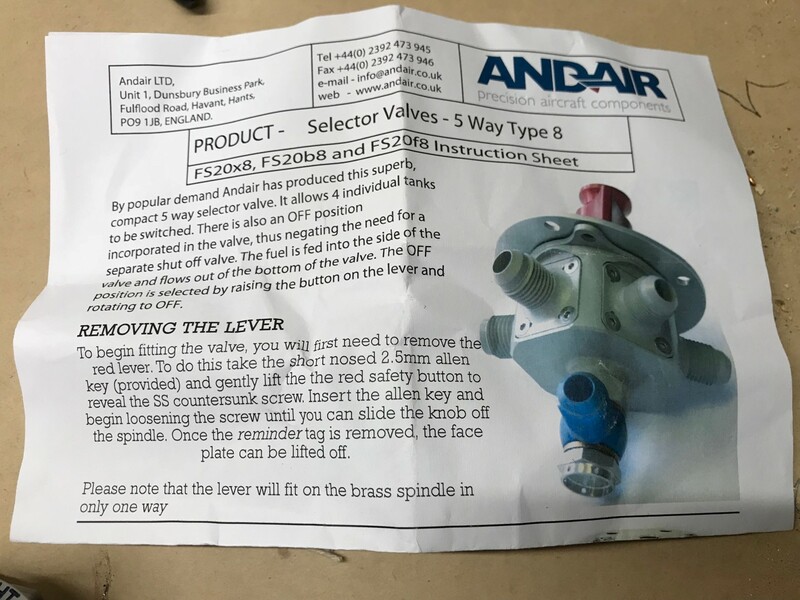 And, while thinking long and hard about it, I called Andair directly and bought the 5-way fuel selector directly from them. It was a few extra dollars (maybe $40 extra), but now I have the ability to carry an aux tank. I don’t think I’ll build an extra tank (or two) now, but I wanted the expansion capability. 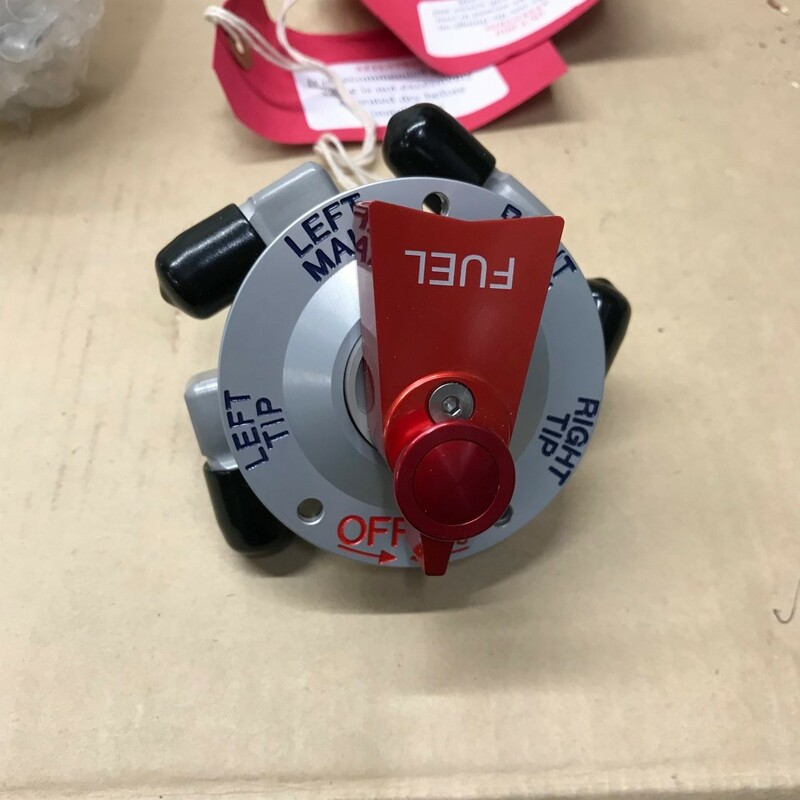 And, I bought a 5-way fuel valve straight from the source. Here’s the data sheet. Kind of. 0.5 hours tonight. I won’t count T-Rex’s time at all yet. Maybe when he’s older. 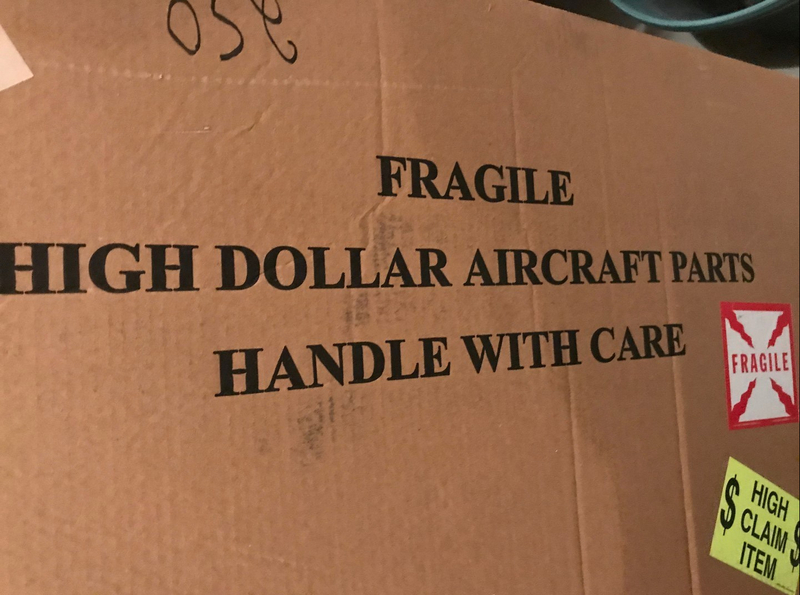 Walking back out to the garage tonight, I walked past the cardboard box in which the replacement skins were shipped, and saw this. Anyway, after finishing the stiffener salvaging from the right half of the rudder, I peeled open the skins, and took this self-portrait. Anyway, an hour later, I had liberated all 16 stiffeners from the rudder WITHOUT any damage. This was quite the commplishment. in total, 105 more rivets drilled out from the right skin, and 116 total rivets drilled from the left skin. 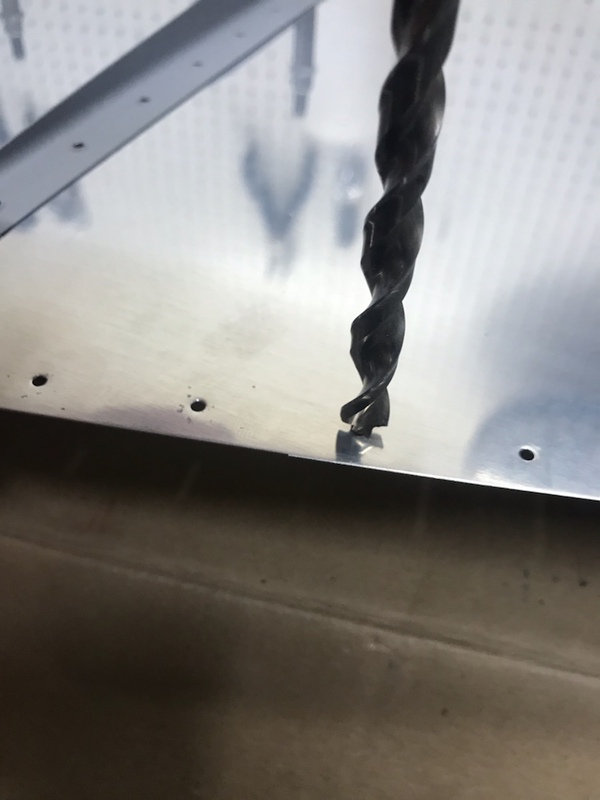 (221 drilled out total). I still have some spar rivets to drill out before starting real construction again, but I’m on my way. First thing, you are seeing some work from the last few weeks. 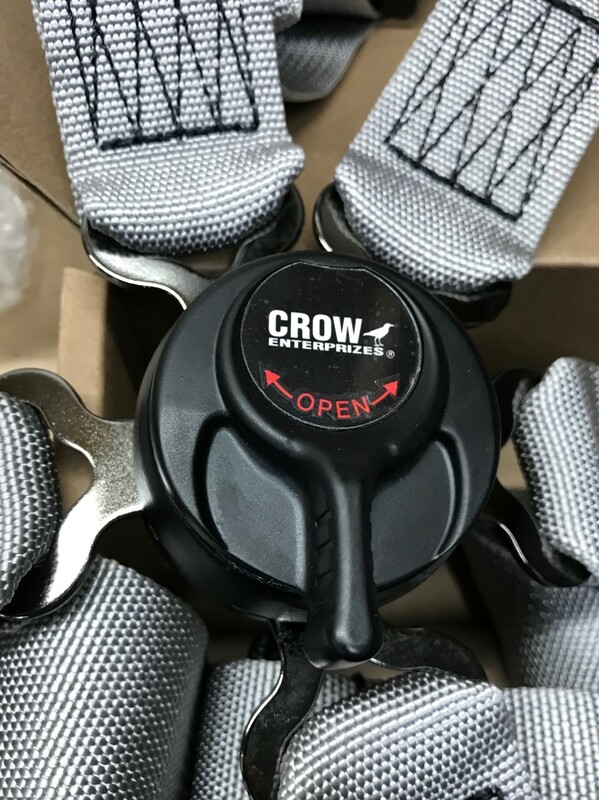 When I got home from the long XC road trip with the RV, I had to immediately reassemble the wing cradle. 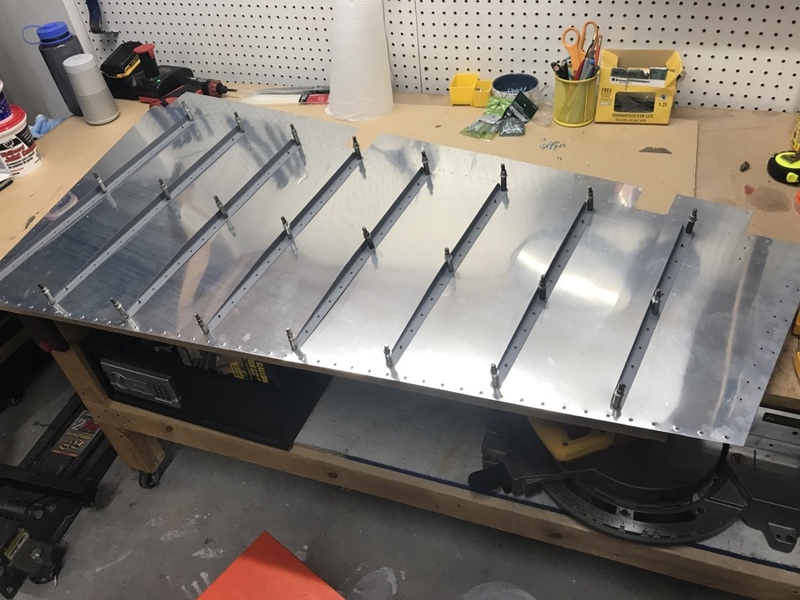 No biggie, just a few 8-foot 2x4s, and a quick redesign of the spar side support. 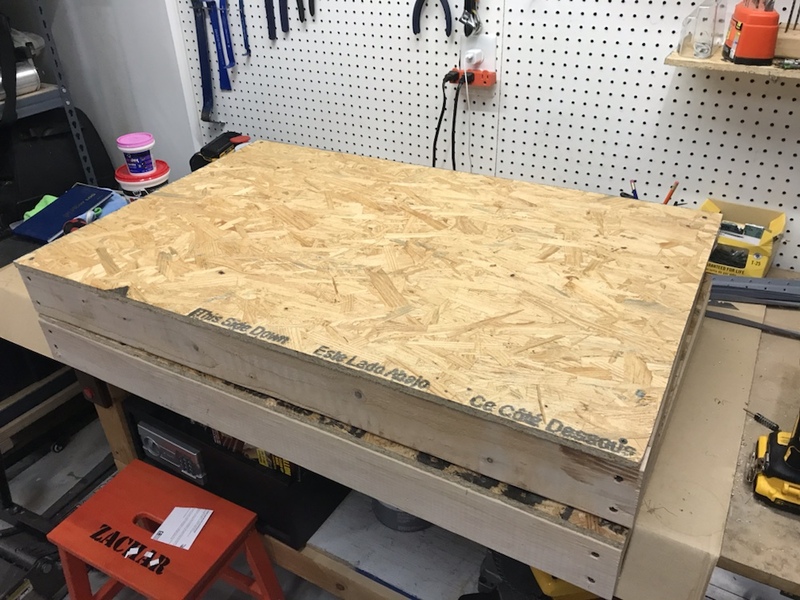 Not exactly per the plan, but I had 2×4 laying around, but no 3/4″ plywood. And yes, I splurged for four 4″ locking casters. So nice. 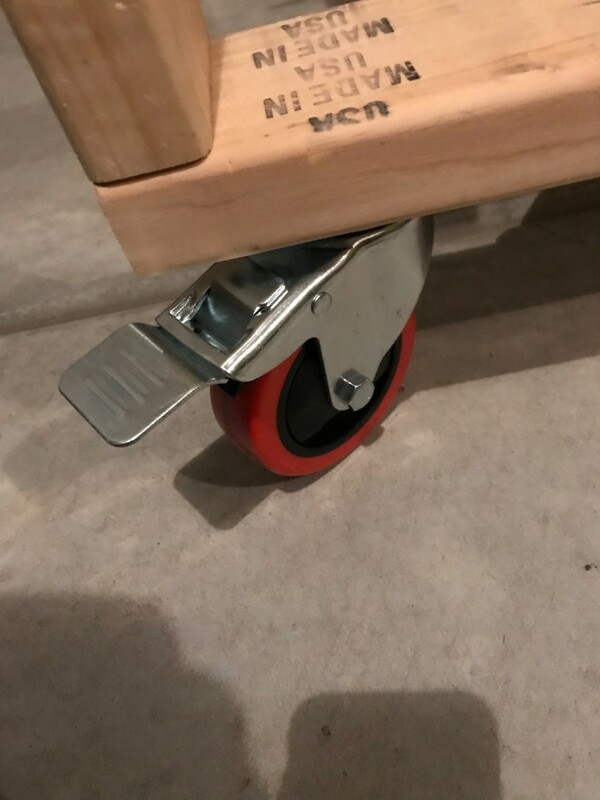 I can’t tell you how nice it is to have 4 nice big casters on this thing. Don’t scrimp here. 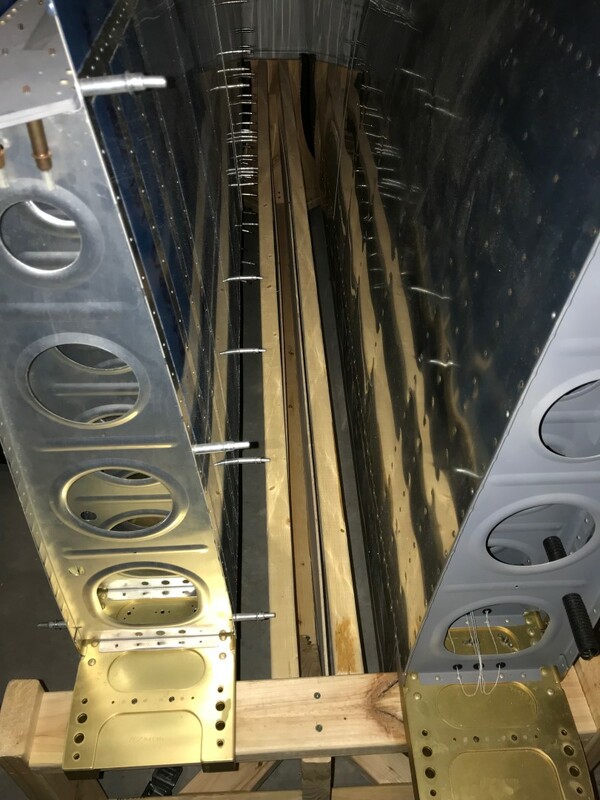 Anyway, given that the left wing hasn’t been started, but the skeleton and skins are clecoed together for transport, I knew I needed somewhere to store some skins once they come back off the skeleton. 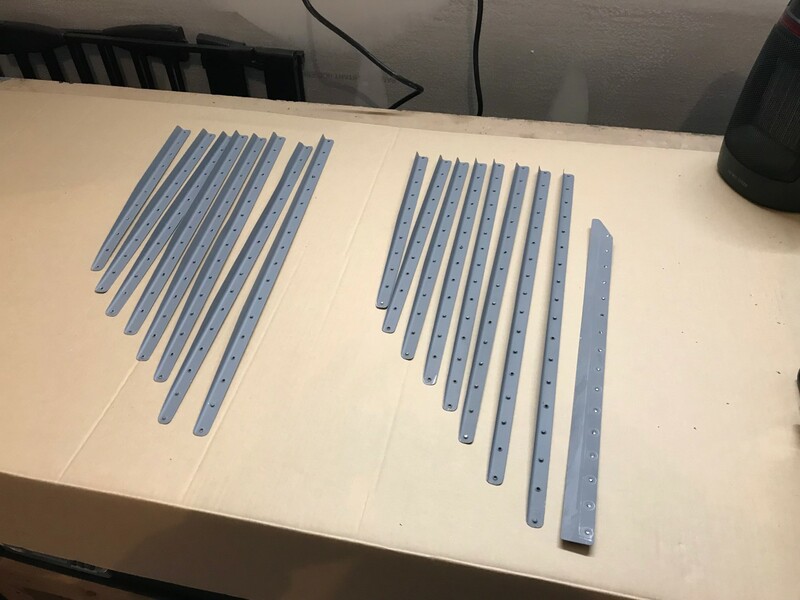 So, I ripped some 12″ pieces of 8-foot long oak paneling I had laying around, and screwed them to the long support on the bottom of the cradle. 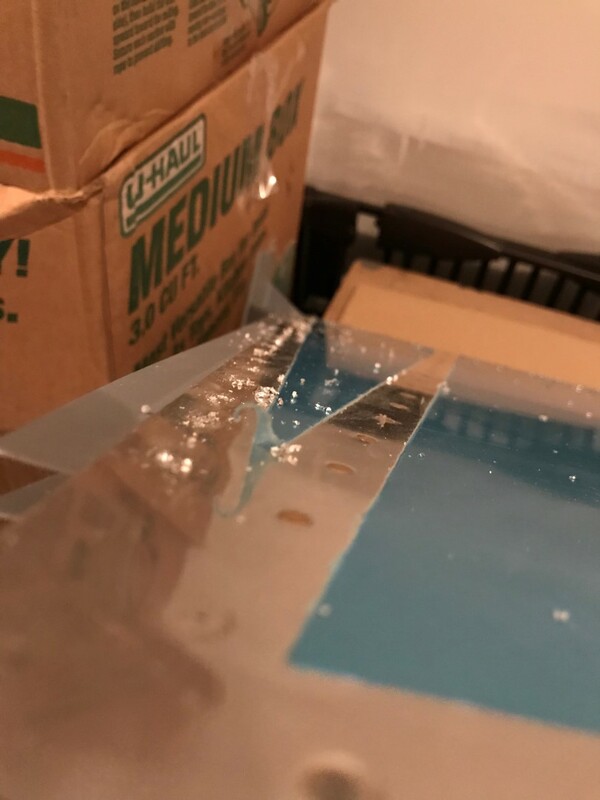 I ripped a 2×4 in half (because I’m cheap) and screwed it into the top support. I’ll call this the “upper” skin support. Now that I have some skin storage, let’s find something to store! 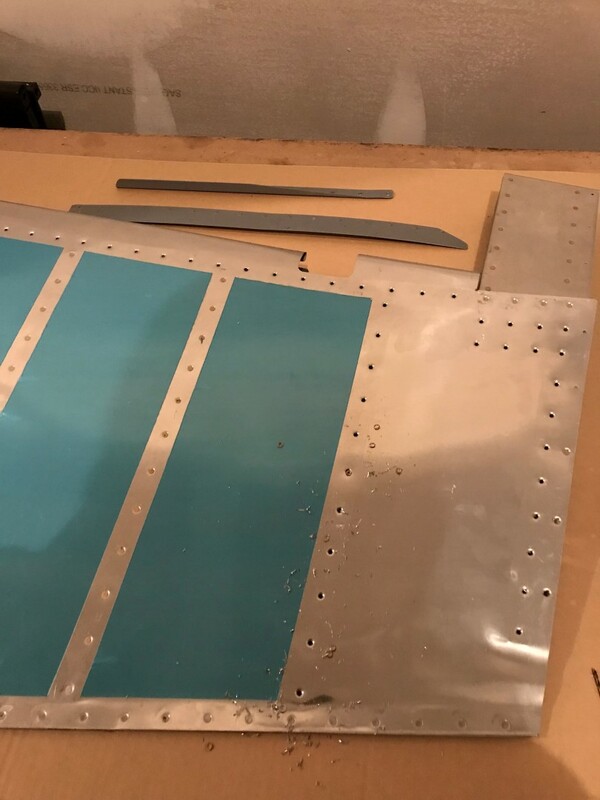 The interim owner of the kit (Jim) had purchased some replacement rudder skins (remember this?) but never opened them. After opening the package, I foudn two brand-spanking-new skins. Far less damaged than the current rudder skins. So, here they are now, in my new skin-storage area. Okay, now. Let’s get some actual building going on. The partically drilled out rudder from 4 years ago. So, I dug out some #40 drill bits, and started drilling. Here’s a gratuitous shot of some aluminum shavings. After drilling out some left-skin-to-spar rivets and the bottom rib rivets, I attacked the upper left stiffener. 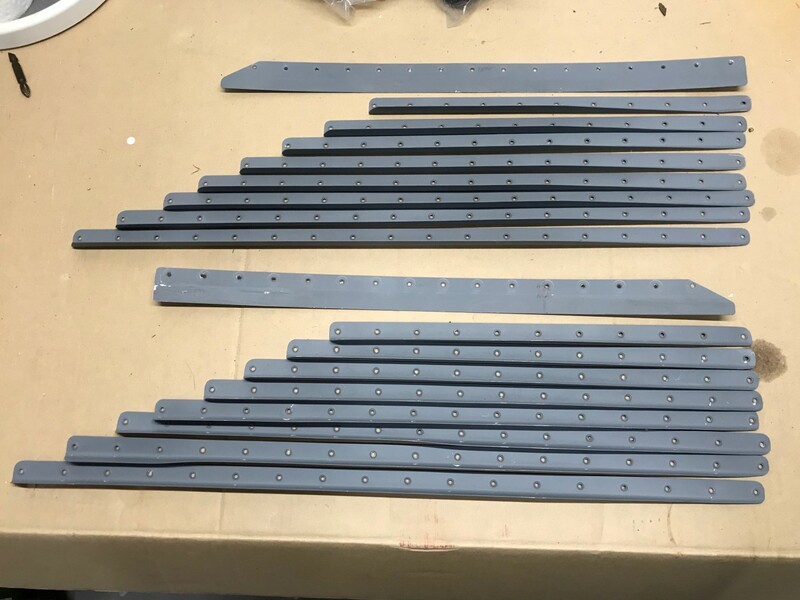 It was 25 rivets for the spar, 20 for the bottom rib, and 11 for the upper stiffener. 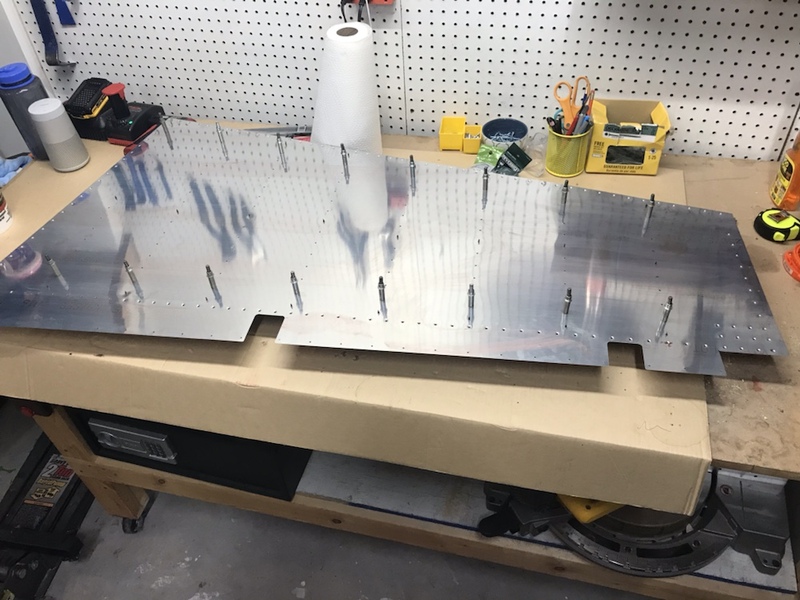 56 rivets drilled out, and a whole lot more to go. You are currently browsing the archives for the Builder's Log category.